Truck collides with motorcycle, killing one in accident between Jerusalem and Beit Shemesh. Two others injured. One person was killed Friday morning in a traffic accident west of Jerusalem. 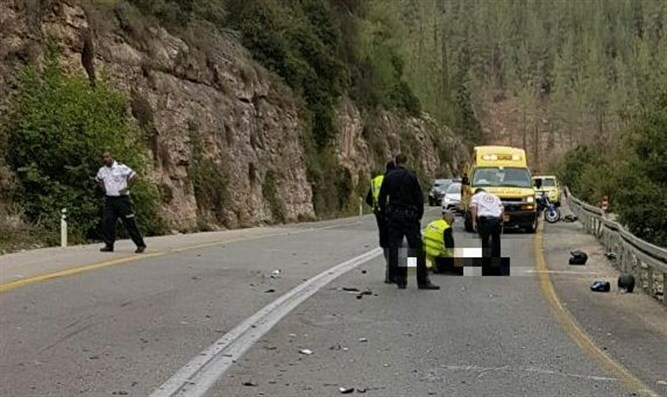 The accident occurred on Route 386 near the town of Nes Harim, roughly midway between Jerusalem and the city of Beit Shemesh in the Jerusalem corridor. A truck collided with two motorcycles on the winding, narrow mountain road, killing one of the motorcyclists, a 25-year-old man. An additional motorcyclist, 27, was injured, along with the driver of the truck. MDA emergency medical teams were called to the scene and treated the injured. The 25-year-old motorcyclist was declared dead at the scene, while the two other victims were evacuated to Hadassah Ein Kerem Hospital in Jerusalem. The 27-year-old motorcyclist has been listed in moderate condition, while the driver of the truck is listed in light condition.